My younger brother Brad and sister-in-law Francine, two great Americans, are on vacation in Prague, Czech Republic [April, 2014]. Knowing how I love classical music, he sent me this text message with video from Prague, telling me "I think this is something you will like." Brad was right! I told Brad the music they were playing was from their great Czech composer, Bedrich Smetana, called "The Moldau." From my classical music post: Sibelius and Smetana Honored Their Countries With Music: "Bedrich Smetana was a Czech composer who became known as the father of Czech music. His music became closely identified with his country's aspirations to independent statehood. Smetana honored his country with a piece called Ma Vlast, meaning my fatherland or my homeland. In it is one of the most beautiful melodies ever written, "The Moldau." The Moldau is the Vltava River, the longest river in the Czech Republic. This piece is one of the most beloved Romantic pieces ever composed; not just by his own countrymen but by fans of classical music everywhere. You will hear the beautiful Moldau theme begin at the one minute mark of this video. "Also, the beautiful melody of this music is incorporated in the Israeli National Anthem, Hatikva - “The Hope” [by Samuel Cohen]. Please turn up the volume and listen to this ultra-beautiful Czech inspired music, composed by the father of Czech music, Bedrich Smetana. As an added bonus, enjoy the beautiful "Hatikva" which uses a theme from the Moldau in its beautiful Israel National Anthem. Such great music, I cannot hear it too often often ...thanks Michael! I was thinking about you good man when I did this piece! Thanks eurobird! Just getting around to listening and watching since we returned last night! Thanks for posting. Loved it! 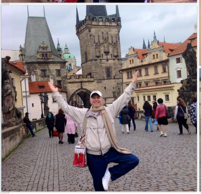 Michael, you and Sheralyn need to go to Prague, Vienna, and Budapest! I learned something again from your wealth of knowledge. Had no idea where the music for the Israeli National Anthem came from. It was a great surprise to me listening to the Czech music for the first time. Thanks.